Tickets are issued subject to the rules and regulations of the Rugby Football Union or relevant competition body and WRFC Trading Ltd (Worcester Warriors). The purchase of the ticket constitutes acceptance of these terms and conditions and also our ground regulations. Admission may be refused if these terms are broken. Tickets are only valid if presented complete and undamaged at the point of entry. If an adult is discovered attempting to obtain entry on a junior ticket, Worcester Warriors reserve the right to cancel the ticket in question and require purchase of an adult ticket at match day prices to enter the Stadium. It is the responsibility of the ticket holder to ascertain the match date and kick off time and to retain the main part of the ticket as proof of purchase. In the event of a game being postponed, all tickets will be valid for the re-arranged date. No refunds will be given unless the fixture is completely cancelled. It is the responsibility of the ticket holder to retain their ticket for the re-arranged fixture. In the event of a game being abandoned with the result standing no refunds will be given. Should the match be abandoned and then be re-played at a later date, ticket holders will be entitled to a free ticket for the re-arranged game upon request. Worcester Warriors accept no responsibility for any seat or standing position affected by adverse weather conditions. This ticket will be void if is used as a prize in a draw, lottery, promotion or advertising purpose, or resold on any internet sales/auction website without the permission of Worcester Warriors. It cannot be sold for more than its face value. Tickets are only valid for the date shown on the ticket or, in the event of a match being postponed, any rearranged date. WRFC and agents will not be liable for loss, injury or damage to the ticket unless caused by their act or omission. Refunds will be considered by Worcester Warriors provided the ticket is returned undamaged to the Ticket Office at least one week before the date of the match. Refunds are at the discretion of the Ticket Office. A junior must be under 18 on the date of the match to qualify for a Junior Ticket. To qualify for a Junior Season Ticket they must be under 18 on 1st September of the season in question. Proof of age may be requested on entry to the ground and we reserve the right to charge the adult price if this is not available. Any complimentary tickets issued are for the match stated only. No exchanges are permissible. Play cannot be guaranteed to take place on any particular day or at any particular time and the Club reserved the right to change its advertised fixtures. Any change will be communicated via the club’s web site www.warriors.co.uk. Please check the web site before you attend your fixture. 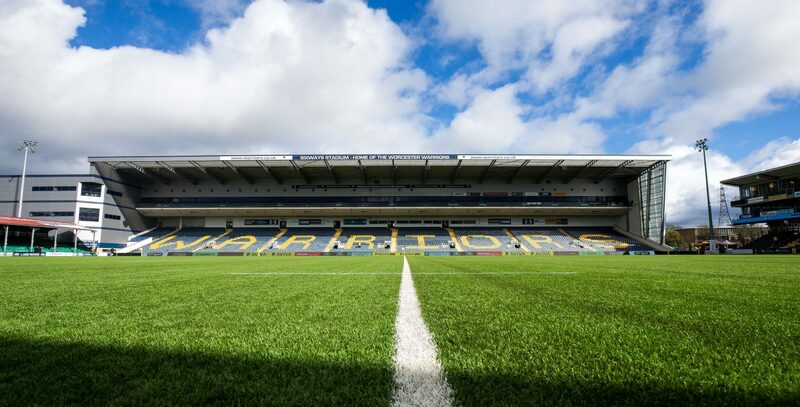 If the purchaser has specific accessibility requirements, Worcester Warriors will do their best to accommodate these providing the ticket holder makes them known at the point of purchase. Children attending matchday experience who have tickets to watch the match are the responsibility of their group leader whilst on-site. At no point during the match are they to be left unsupervised. Tickets are not transferable and under no circumstances can seats be exchanged for empty seats around the stadium. Behaviour of the children is the responsibility of the group leader. Monies paid for non-arrivals are forfeited, non-transferable to forthcoming events and can not be transferred to cover food drink or entertainment on the evening. All events and times are subject to approval of the local licensing authorities. All Statutory licensing regulations apply. The information on this website is correct at the time of publication. The club reserves the right to amend its packages and prices at any time prior to booking. WRFC Trading Ltd reserves the right to alter or amend the content of an event or to cancel and event for any reason, for example if there is a shortfall in numbers required to operate a programme. In such circumstance, subject to availabilty you may chose at your sole discretion to move your booking to an alternative date or obtain a full refund from us. Some of our dishes may contain ingredients that could cause an allergic reaction. All guests who suffer from allergies are strongly recommended to make these requirements known to us prior to the event. Other than for death or serious personal injury caused by our negligence, our liability to you is limited to the price of your booking. WRFC Trading Ltd will not be liable to you for failure to perform to the extent that the failure as caused by any factor beyond its reasonable control. Please address any comments to the Head of Commercial in writing within 14 days of the event. Sixways Stadium is a non smoking Stadium Complex. Sixways Stadium operates a zero tolerance policy relating to verbal or physical abuse towards its members of staff and will take every measure to enforce and uphold this policy. All hospitality packages are sold subject to the Worcester Warriors Ticketing Policy and Ground Regulations. In the event of cancellation, no refunds will be considered unless cancellation is due to the date of the fixture changing after booking has been confirmed. No food or beverages may be brought into the Club premises for consumption on the premises without the prior written consent of the Club. If such consent is given a charge may be levied. The provision of alcohol other than that purchased or supplied direct from the club is strictly prohibited. This includes, but is not solely restricted too, food purchased in the retail ‘fast food’ outlets. All prices are exclusive of Value Added Tax at the current rate.